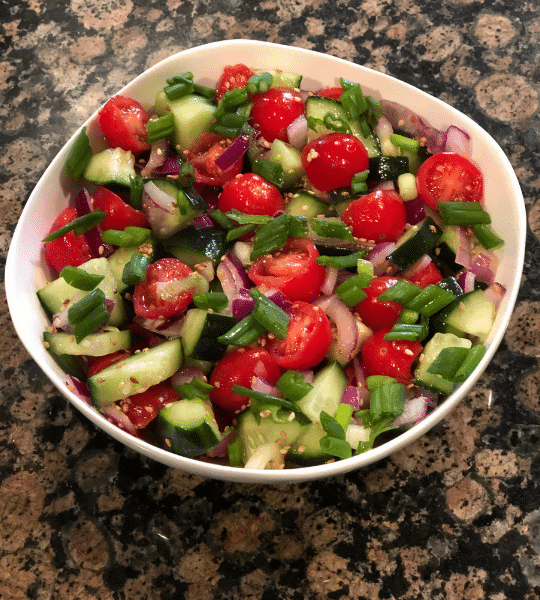 Tomato cucumber salad is delicious and healthy. It is fresh, crunchy and excellent for any weather. This salad can serve as a perfect side dish for the main meal. You can as well eat it as a snack or an appetizer before your main dish. This salad has a combination of colors and textures which even kids will love. 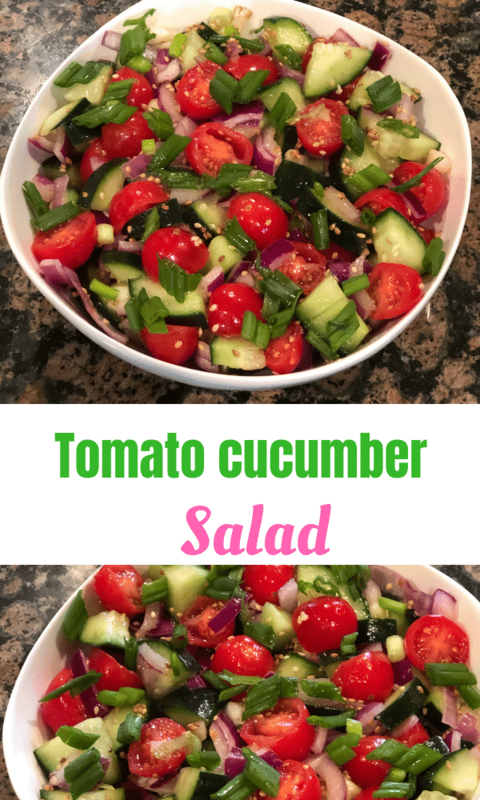 Tomato cucumber salad is inexpensive and easy to make. You will need to spend only a few dollars to buy the ingredients. Then just spare a few minutes to make it since it does not require any cooking or many ingredients to make. I love this salad; It is has a variety of textures and colors. These are not only refreshing but are also appetizing. I hope you will enjoy it as I do too. Since it does not require any cooking or many ingredients to make, it is very convenient to make. How to make tomato cucumber salad. Wash and clean all the vegetables in clean water and dry with a clean towel after that cut them in desired shapes and sizes. Transfer the chopped vegetables to a large bowl and pour your dressing on top. Toss to mix well. In another separate bowl, pour two tablespoons of apple cider vinegar and two or more teaspoons of honey then mix well. Add the salt and two tablespoons of toasted sesame seeds. Mix well and pour it on your salad. You may opt to leave out the sesame seeds if you like but still have your delicious salad. Thereafter toss to combine well. Chill and serve. You can serve this tomato cucumber salad as a side dish to the main meal. You can as well make it more filling and satisfying by adding some lean protein or even nuts to it. Add proteins and fats to salads in moderation because too much can add more calories which can cause weight gain. 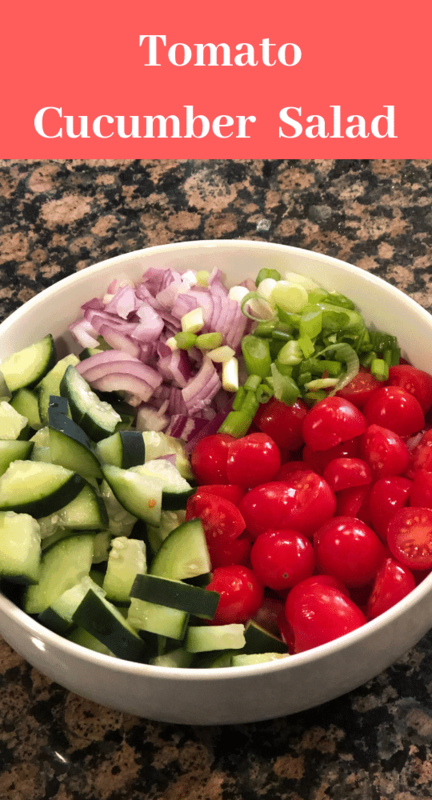 What are the health benefits of tomato cucumber salad? Tomatoes and cucumbers are high in nutrients. They are very low in calories which means you can eat plenty without adding weight. In addition to that, eating them before the main dish can have a filling effect in your stomach. This may prevent overeating and in turn aid in weight loss. Coupled with that these vegetables have high amounts of vitamins, antioxidants, minerals, and fiber. They have high contents of water which helps to hydrate the body. The antioxidant and vitamins in these vegetables/fruits help fight free radicals and boost immunity. This salad is excellent for weight loss. The tomato cucumber salad is high in fiber. In addition to that, it has low calories. You can eat plenty without adding extra calories which can lead to weight gain. The high contents of fiber and water in tomato cucumber salad can also reduce constipation. They aid in digestion and promote bowel movement. The high contents of water in this salad can as well help speed up metabolism and weight loss as well. Cucumbers also contain vitamin K which essential for bone health. In combination with vitamin D, it may also help with the absorption of calcium for the formation of bones. Eating this salad often can also help nourish your skin due to the presence of phytochemicals in it. cucumber and tomatoes can also lower blood sugar levels in the blood. 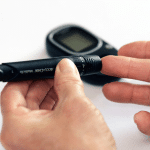 These vegetables have a low glycemic index thus may not cause a spike in blood glucose. The dressing for this salad has a combination of honey, apple cider vinegar, salt, a little olive oil, and toasted sesame seeds. All the ingredients in this salad are beneficial for your health. They also help make the salad delicious.